Join two tables in action. 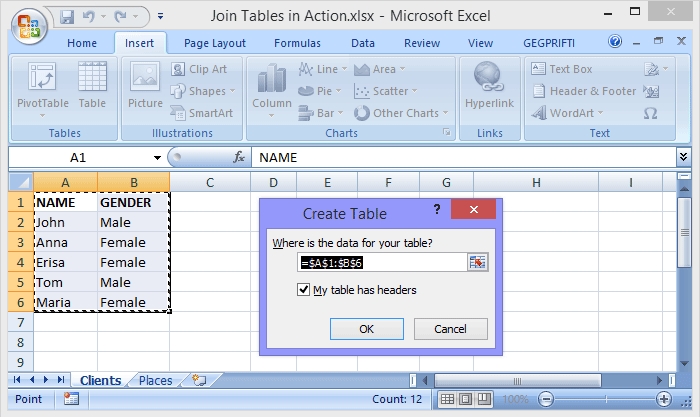 "Join two tables" module is specific in querying two tables and performing results like in a database environment. This functionality is usually performed by the vlookup function in Excel. 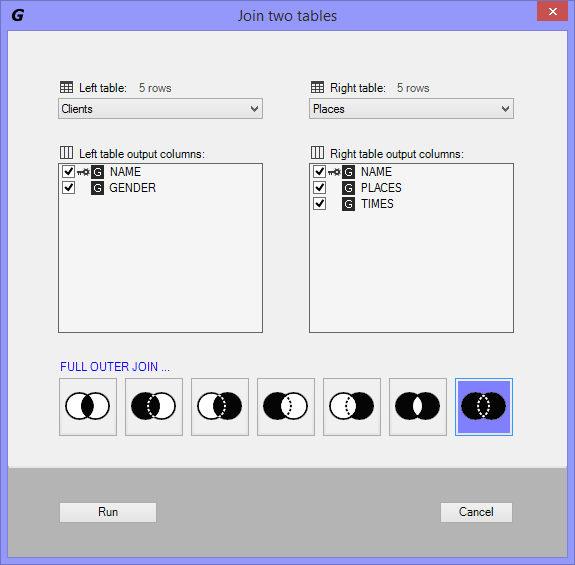 The "Join two tables" module enhances the work on querying tables by presenting an intuitive graphic user interface which makes it an easier process. With no need for writing functions or SQL codes, you can get query results in just a few seconds. If vlookup function is confusing you, then this module will save you time and effort. 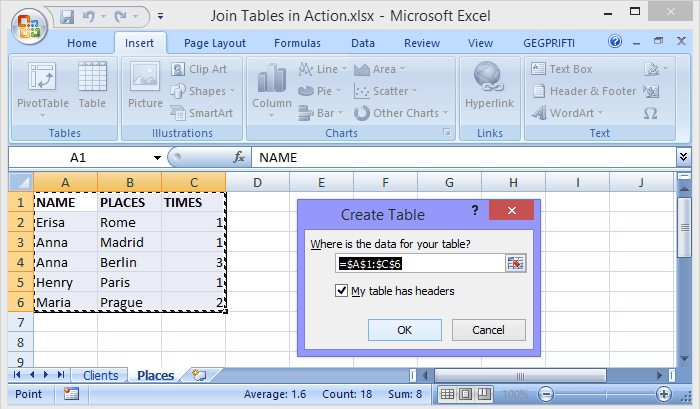 The following tutorial will show how to join two tables like in a database environment. This tool is useful especially when you are comparing big lists of data like finding names that are or are not in both table lists. After installing make sure the GEGPRIFTI tab is showing. 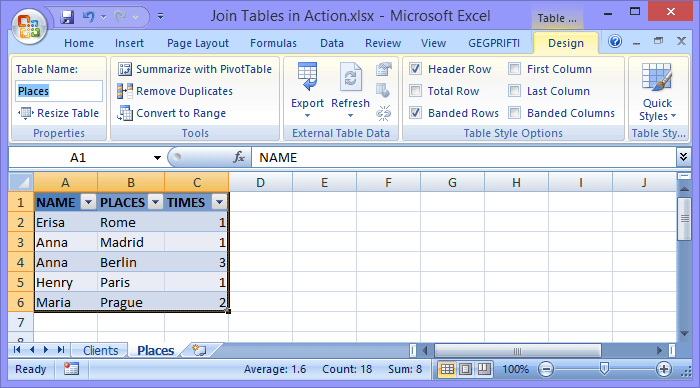 To start make sure you create the two tables you want to join. Let's start with the creation of the first table. 1. Select the range of the first table and make sure you include the header labels also. 2. Got to "Insert" tab then in the "Tables" group click the "Table" button. 3. In the "Create Table" dialog box make sure the "My table has headers" checkbox is checked and then click "OK". By default the created table is named as Table1, Table2 and so on.. You can change the default table name by going to "Design" tab and in the "Properties" group changing the "Table Name:" to Clients. Following the steps above to create the second table. Rename the second table to "Places". Go to "GEGPRIFTI" tab and in the "Database" group click the "Join two tables" button. In the "Join tables" window select the "Clients" table from the "Left table" list of tables and then select "Places" from the "Right table" list of tables. 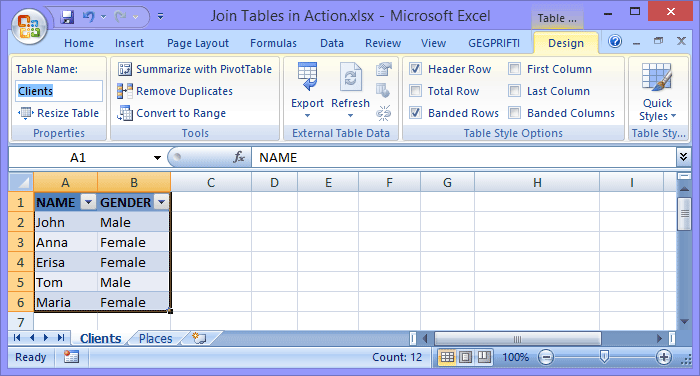 By default the first column in both tables is used as a key join. If the key column to join tables is not the first column of the table then you can right click the column and set it as e key column. Select the last join type "FULL OUTER JOIN" and then click "Run". Note: for a detailed explanation of other join types you can perform see the documentation. Below is the result and in this case we have all rows that match by the key column we specified. Also we have the cases where there is no match from left or right table.